Had you found the photographs currently on exhibit at the Old College Gallery in a shoebox at your house, you may have tossed them out. But if you noticed the photos were of Farah Diba, Empress Consort of Iran and Marella Agnelli, you might have kept a few after all. And then you would have puzzled about those faces you did not recognize. Mr. Petersen was ebullient in his gallery talk at Old College on February 17. 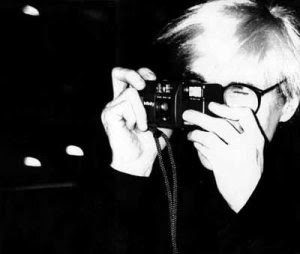 His knowledge of Warhol and the collection imbued his note-free speech with zest, and his background in photography made him perfect for the job. He has an MFA in photography, but his attention for detail meant that he had researched every aspect of each camera – down to details like the use of the “magic cube” flash bulb, the mention of which had some members of the audience nodding as they remembered using them. His excitement was contagious and made the visit to the gallery a much deeper experience. Mr. Petersen displayed cameras exactly like the ones Warhol had used for his photographs and he talked to the crowd about how the cameras were innovative at the time -- intended to be the perfect family portrait machine. He spoke about the irony of using a twenty-dollar Polaroid Bigshot to prepare portraits of the glitterati and nobility willing to pay him a $25,000 commission for his work. He also spoke of Warhol’s life and work: Warhol reveled in the underground of the New York art world until he was shot and seriously wounded. He then tried to slow down and live life a bit (but not too much) more staidly. Petersen arranged the photographs in chronological order so that you can see the polaroids and move on to the black and white gelatin silver prints which have more experimentation and spark to them. You also see models of the ‘point and shoot’ cameras which Warhol used: a Minox with synchronized flash, a Chinon autofocus and an Olympus QuickFlash. Thanks to Stephen Petersen, the Old College Gallery exhibit will give you an insight into the private Andy Warhol – so different from the one we conjure up when contemplating Brillo boxes, Campbell’s soup cans and blocky silkscreen images of Marilyn Monroe. See "God of Love" at Theatre N Saturday! Can newspaper photography be art?